Royalist Infantry (Elites) [RI-02] - $7.20 : Grenadier Productions,, Home of Liberators! 12 figures in 4 poses; Elite Granadero (grenadier) and Cazadore (light infantry) in summer campaign uniform: jacket with no tails & shako. 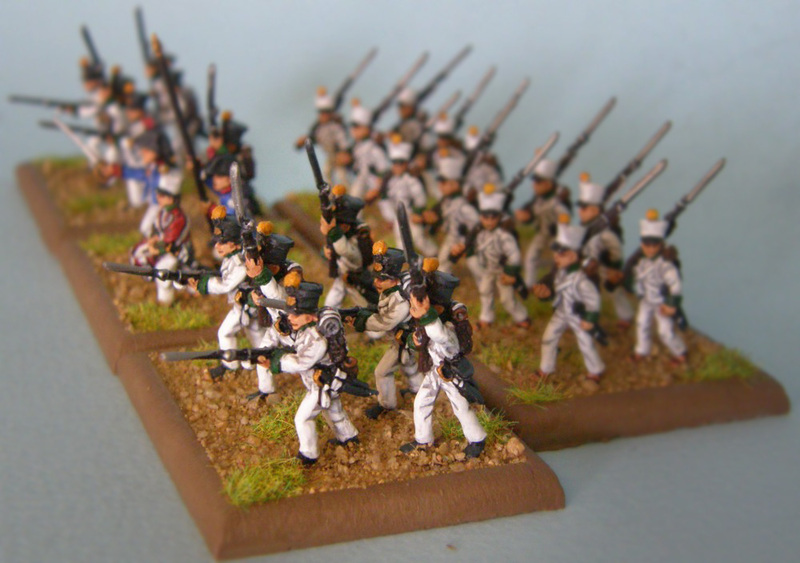 Use these figures for the grenadier and cazadore companies of your battalions. Also known as the "elite companies", granaderos were the tallest and strongest men in the battalion while cazadores were selected for their agility and intelligence. The main difference between these models and the fusileros is the addition of a saber along with their bayonet. Additionally, these troops have been sculpted without oilskin covers on their shakos to help you easily distinguish them on the table top. For a variant of your granaderos, consider AI-02 Argentina Infantry (Granderos). Some later war Royalist battalions used the same style "shako bag" depicted on these troops.